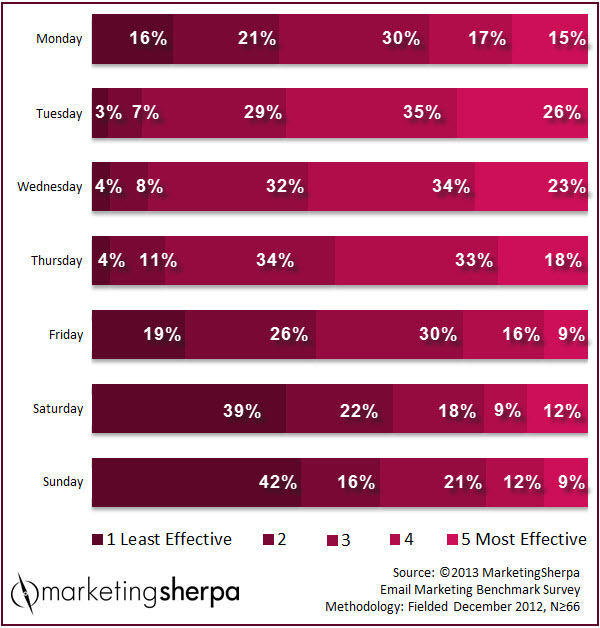 Marketing Research Chart: Which day is best to send emails? SUMMARY: You've researched the content or promotion that would be most appealing to your audience. You worked with a professional writer or designer to create the email, or perhaps created it yourself. Essentially, you put in all of the hard work to make your email marketing send effective. But now, your marketing technology expert is ready to set the send in your ESP and has a question for you: "What day should I set it for?" Read on to see which days are most effective to send emails, according to your peers. What should you send? — What content or promotion will best serve your audience and get them to act? Who should you sent it to? — An organically grown opt-in list? A purchased list? A partner’s list? What segment of that list? To help you come up with test ideas to answer that last question, we asked your peers, "How effective are emails sent each day of the week?" in the MarketingSherpa 2013 Email Marketing Benchmark Report. As you can see, Sunday was the least effective day to send emails, with Saturday following close behind. Tuesday was rated as the most effective day for sending emails. But, before you give your email marketing a day of rest, keep these three factors in mind when considering email timing. We're providing this aggregate data for two reasons. First, you can use this chart to encourage your team to consider how day and time of the week affects the performance of your email marketing. And second, this chart is to give you ideas for days to test with your audience to find out what really works best. For example, if you’re sending on Sunday now, perhaps try testing a Tuesday send. This is the overall goal because the performance with, and even within the segments of, your unique audience interested in your unique product and with your unique newsletters and promotions may vary greatly from what works for your peers. There is no single right answer for the best day to send that applies to every company. To illustrate that point, when we look at the breakout data, Sunday was still the least effective for B2C marketers, but only 23% rated it as least effective, while 55% of B2B and/or B2G marketers rated Sunday least effective. For marketers who have both a B2B and B2C audience, Wednesday was tied with Tuesday for most effective. Those working for a marketing agency or consultancy rated Wednesday as most effective. Marketers working in the professional, personal and financial services industries rated Saturday as least effective. While 20% of marketers in retail, e-commerce or wholesale distribution rated Sunday as least effective, 40% gave the day a four or five (most effective). And, a whopping 60% of software, software as a service or video game marketers rated Sunday as least effective. The point being, as the below marketer said in responding to the benchmark survey, you have to test to know what works best for your business. "We want to be able to determine which time and day is the best to deliver to our target audience. They are busy people so is it best to email them at six in the morning so they can read it over their breakfast, or at 6 p.m. at night when they need a break? Test, test, test and then test some more." Of course, before you can launch your first test, make sure you have a testing methodology in place so you can truly learn from your tests. If you are not able to test, at the very least make sure you are tracking email marketing performance, as this market research manager pointed out. "We have just started on the journey of eDM and have spent considerable time setting up the analytics framework to measure behavior and activity. That's why we couldn't comment on the different impact of day sent as we have not collected enough data. So, our challenge is to build the analytics in, but to also maximize eDM as a communication tool." Lastly, email timing would be easier if we all just lived in one giant time zone. Since we do not, understand the impact of the geographical spread of your audience on your send time. Also, understand cultural differences throughout the regions you serve, as indicated by this marketer who had a firsthand experience. "We're located in Israel, where Sunday is a workday, and some of the email providers are having their maintenance jobs on Sunday, which sometimes makes the system unavailable to use."